Movies tend to depict exterminators in full hazmat suits and gas masks power-washing houses with backpacks full of the “good stuff.” Unfortunately, many today suffer the consequence of yesteryear’s approach to pest management. Both chemicals and applications were the reason for the decline of many wildlife species and the health decline of individuals. Additionally, these treatments have often concluded to be ineffective and costly. IPM’s claims seem too good to be true at first. How can a pest management technique not only be more effective, more environmentally friendly, and be cost effective for the consumer? IPM works by knowing the pest in order to manage it. If we can understand the pest’s biological needs, then we can choose from a variety of different non-chemical procedures to reduce current pest populations and prevent future ones. When chemical applications need to be used, less hazardous ones are chosen. Identify: The first step taken when implementing an IPM program is the identification of the target pests. All pests require different approaches to pest management. In order to custom tailor a program, we must identify the pest and understand its biological needs. For example, different species of ants will need drastically different treatments, so being able to identify the subtle nuances between different species is paramount to an effective treatment. Evaluate: The second step is to evaluate the problem. Why are the pests here? Where did they come from? How did they get in? How many are there? Answering these questions will give an idea as to what measures should be implemented. For example, if you have mice, determining how they got inside and what their food sources are will help us come up with a strategy to eliminate them without the use of excess rodenticides. Prevention: Using what we learned in our evaluation will come in handy in this stage. Reducing food sources, eliminating harborage areas for pests and sealing entry points will deter new populations in the future as well as make it uninhabitable for the current infestation. This step is designed to try the least hazardous methods first so chemical treatments will be kept to an absolute minimum. Additionally, taking a proactive preventive step will reduce the need for future treatments. Action: Finally, it’s time to introduce our method of treatment. IPM is about merging all possible control methods instead of relying on a single one. This, yet again, reduces the need for harmful chemicals and is more effective because it doesn’t rely on a single system that may fail. For example, using a multi-pronged program including baits, traps, and dust to take care of a roach infestation will always be more effective than just one aspect alone, and will reduce the need to use harsh chemicals. Record: The final step is to monitor the results and keep a watchful eye on the problem. Has the infestation gone away? Did it get worse? Has sanitation levels stayed the same? What aspect of the treatment was the most successful? Actively monitoring helps nip future problems in the bud and is, therefore, a crucial aspect of the IPM approach. As you now see, IPM is not only the most beneficial to our health and the environment; it is the most successful form of treatment. IPM also cuts down on the use of pricey chemicals and prevents future problems, making it a cost-effective solution. 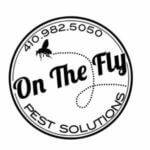 Here at On The Fly, safety and sustainability are our top concerns. Are you ready to implement IPM in your home? Contact our office learn more about why IPM is the right decision for you!